A fire risk assessment evaluates your premises in terms of fire safety hazards to people and property. An assessor visits your premises, makes a physical inspection and provides you with a clear and concise report. This report will detail a prioritised action plan on how to minimise identified risks. The assessment usually takes about a day all in. WHY DO FIRE RISK ASSESSMENT PRICES VARY SO MUCH? We are priced somewhere in the middle, often around £595 for a standard fire risk assessment. But with us you get value for money for a professional service that delivers all the assurances you need. You receive an expert assessment carried out by a competent person as required by law:- All our fire risk assessors have a minimum of 10 years fire brigade experience or equivalent All our assessors are members of the Institution of Fire Engineers All our assessments are fully backed up by Professional indemnity of up to £500,000 per assessment At the end of the visit you will receive a report written in plain English and easy to understand, no jargon. We will also go through the report with you to make sure you are clear about everything. WHY CAN'T I DO THE ASSESSMENT MYSELF? You can, if you have the time and expertise to do it. For an untrained person a fire risk assessment can be time consuming and might not meet the legal requirements. You may want to leave it to the professionals. The law clearly states that fire risk assessments are carried out by a 'competent person'.In terms of fire insurance we know that loss adjusters are using the details of this clause to withhold payment (in the event of a fire) if they are not satisfied in regard to compliance. WHAT WILL HAPPEN IF I DON'T HAVE A FIRE RISK ASSESSMENT? Your business has to have a fire risk assessment by law; the punishment for not having one is severe AND you'd be putting everyone in your business at risk. If that isn't enough it is very doubtful that your insurance would pay out in the event of a fire. The consequences of that are unthinkable. Whatever you decide, don't just do nothing! FIRE RISK ASSESSMENTS - WHAT'S THE LAW? The Fire Safety Order places the responsibility for fire safety on the employer or 'responsible person' for the building or premises. In reference to Fire Risk Assessments the law states:-"The Responsible person at any premise must have a suitable and sufficient fire risk assessment carried out by a competent person. "The definition of 'competent' is where a person has had sufficient training to carry out that role, this could be an employee or an outside contractor. Competence is demonstrated through sufficient training and experience. The 'responsible person' is the person/s who owns or controls the business. This is also the owner of the property. If the two are different they must share responsibility and are obliged to co-operate. All assessments can be carried out across the UK. 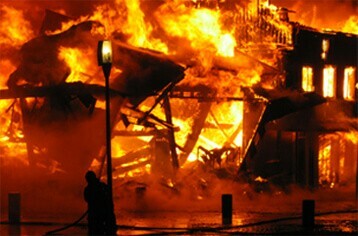 Fire Inspections are now taking place unannounced throughout the UK. If you don't have a fire risk assessment your business may not be insured if a fire does take place!